The terms grounded and grounding are very similar, but their meanings are quite different. In any electrical circuit, there are two wires needed to complete any circuit. One is called the "hot wire" and the other is called "neutral" or "grounded". Sometimes the neutral wire is referred to as a grounded wire. It is most correctly referred to as a "grounded neutral conductor," but most times referred to as "the neutral" or "the ground wire". Since the neutral or grounded wire is a necessary part of the electrical path, grounded wires carry electrical current under normal operating conditions. A grounded wire is required by the National Electrical Code to be white or gray in color on the customer side of the meter. Grounded wires on the utility side of the system do not generally have insulation. A "grounding" wire on the other hand is a safety wire that has intentionally been connected to earth. 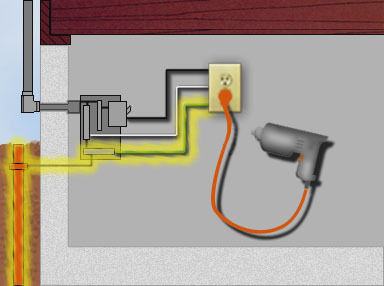 The grounding wire does not carry electricity under normal circuit operations. It's purpose is to carry electrical current only under short circuit or other conditions that would be potentially dangerous. Grounding wires serve as an alternate path for the current to flow back to the source, rather than go through anyone touching a dangerous appliance or electrical box. Confusion arises because it is commonly referred to as a ground wire even though it is more correctly called a "grounding" wire. Some people will refer to this wire as the "case ground" since this wire is typically connected to the cases or outer parts of electrical boxes and appliances and tools. The grounding wire is required by the National Electrical Code to be a bare wire, or if insulated, a green or green with yellow colored insulation.